From Koto. Batman returns to Kotobukiya's hit ARTFX+ line of superheroes & villains based on DC Comics characters, this time with Batman in his new armored costume from the Batman: Arkham Knight game. The 2015 installment is the fourth in the Batman: Arkham series and takes the Caped Crusader to a whole new level with a heavily armored look fully realized in this highly detailed, 1/10 scale presentation, which captures him in mid-leap as he flies through the air in a dynamic pose that's sure to catch any collector's eye. A first for the ARTFX series, Batman comes with a new modular base system that lets you customize your display with a wide range of options. 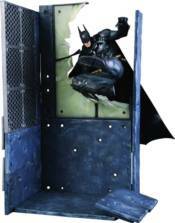 Display Batman breaking through a wall, valulting over rubble or in the middle of delivering a flying side kick! With multiple square & rectangular pieces - plus a broken window, metal grate and joint parts -- this set is all about building your own diorama base. Even better, you can really craft your own unique display by combining Batman's architectural elements with those of his arch-enemy the Arkham Knight (statue sold separately) and show off the two fighting in a rich and complex Gotham City environment! Lastly, as a special bonus, every bullet hole in the walls is approximately 4mm in diameter so that it can display Frame Arts model kits or Modeling Support Goods, making it the perfect environmental display for other figures or ARTFX+ statues in your collection!